Earlier this year FODI members enjoyed a pilot scheme of football sessions in collaboration with YAV. The feedback from the footballers was very positive. These sessions provided the opportunity for health and fitness training and the chance to play and bond with others from many cultures through a much loved sport. 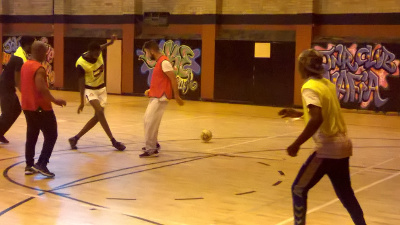 Now due to the success of a Comic Relief bid, we are able to offer 30 sessions over the next year where members can train hard and play hard with qualified coaches at Sans Street Centre every Thursday 4 – 6pm.